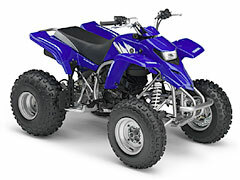 Including the more mature sporty model "YFZ450" Release of the new 2006 model Yamaha ATVs - News Releases | Yamaha Motor Co., Ltd.
On July 1, 2005, Yamaha Motor Co., Ltd. (YMC) releases on the Japanese market the 2006 model of the popular sporty-performance Yamaha ATV "YFZ450" with some spec changes for greater product maturity and boosted performance from its liquid-cooled DOHC 5-valve, 449 cc engine. 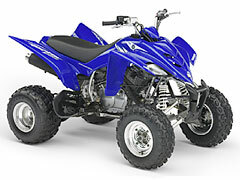 On the same day the 2006 models of the other Yamaha ATVs will also be released with new coloring and graphic designs. 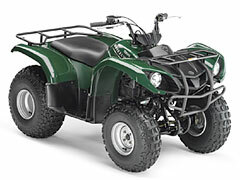 The 2006 Yamaha ATV lineup consists of six models ranging from the 80cc "YFM80" to the 660 cc "GRIZZLY 660" (four sports models, two utility models). 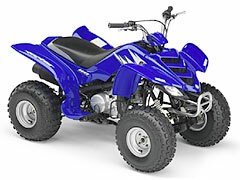 2006 model Yamaha ATV "YFZ450"
With their characteristic low-pressure balloon tires, ATVs (All Terrain Vehicles) can go virtually anywhere on off-road terrain, whether its grasslands or rocky hills, sand dunes or snowfields, flats or inclines. That is why people around the world use them for a wide range of work and leisure riding. In Japan, annual demand for ATVs has stood at 500 units and use varies widely from leisure and sports to commercial and utility uses. 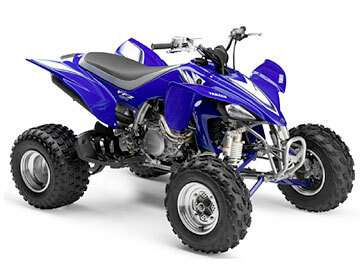 Presently, Yamaha offers a lineup of six ATV models ranging in engine displacement from 80cc to 660cc. The "YFZ450" borrows technologies from engine of Yamaha's hard-running production motocrosser YZ450F to create a "4-stroke lightweight sports" model capable high-performance sport-type riding. The product value of the 2006 model has been further heightened by boosting engine performance with increased displacement and new specs for the combustion chamber shape and the intake system while also adding new body parts like a titanium exhaust pipe protector for a more mature chassis spec. The engine displacement has been increased to bring out a new level of performance. The bore has been kept the same as the existing model while the stroke has been lengthened from 62mm to 63.4mm, thus increasing the displacement from the existing 439cc to 449cc. To optimize performance for the new larger displacement engine, the shape of the combustion chamber has been changed. Outstanding performance has also been achieved by optimizing the shape of the cylinder head for maximum efficiency in the intake valve's initial opening stage. To accommodate these changes, the intake port shape has also been changed. A lightweight titanium exhaust pipe protector has been adopted to reduce weight while also improving the exterior appearance at the same time. Other engine spec changes include new carburetor setting, new colors for exterior parts, a new radiator fin design, etc. Changes have been made in both the front and rear suspension settings to achieve a more comfortable ride and sportier performance. This power unit is characterized by its lightweight titanium valves, FCR carburetor with TPS (Throttle Position Sensor) known for its excellence response characteristics and highly reliable plated cylinders. This is matched up with a close-ratio 5-speed transmission to provide sharp and easy to use power. Both the front and rear suspensions feature initial load adjustment and separate compression stroke and rebound stroke damping force adjustment to let the rider set the damping characteristics to suit the terrain or personal preference. To ensure stable performance, both the front and rear shock absorbers feature piggy-back type aluminum sub-tanks. What's more, the rear suspension features the same type of link mechanism used on Yamaha's YZ motocrossers and the first lightweight, cast aluminum rear arm ever on a Yamaha ATV. A lighter body has been achieved by the adoption of lightweight design features like magnesium cam and clutch covers, a high-tensile steel frame, CF die-cast aluminum rear frame and cast aluminum rear arm and aluminum wheels and hubs. 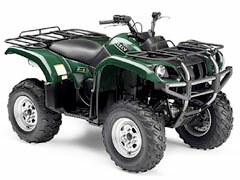 This is a utility model mounting a 660cc liquid-cooled 4-stroke engine for plenty of power in forestry or ranch work. One button enables easy switching between 4WD, 2WD and differential lock. It also features big load capacity. Mounting a liquid-cooled 4-stroke 124cc engine on a compact, highly maneuverable chassis, this model boasts the same heavy-duty exterior as the GRIZZLY 660. This is a sports model mounting a fast-charging air-cooled 2-stroke 195cc engine. It features a front double wishbone and rear Monocross suspensions. This model mounts an air-cooled 4-stroke SOHC 2-valve engine. In combination with the 6-speed transmission it boasts spirited running performance. It features a linked type rear suspension with piggy-back type gas chamber. This is an entry-level model with a 3-speed semi-automatic transmission.